Small bumps in your neck can be a little scary but often they are not anything to be concerned about. Lymph nodes in the neck and other parts of the body commonly swell in response to fighting diseases. Usually these infections are minor and treatable, and some even run their course without treatment. However, if the swelling or pain continues over two weeks, you shouldn’t ignore it because it could be a sign of a severe disease, infection, or illness. Only a healthcare professional can determine the cause of enlarged lymph node glands. Treatment will depend on the cause of the swelling. The submental and submandibular nodes location is under the jaw line, and the jugular nodes location is along the side of the neck with others located in the front of the neck and near the ears. These nodes drain the lymph from the scalp, the eyes, ears, nose, and mouth. When there is an infection, injury, illness, disease, bacteria, or virus then the nodes will swell up to fight the problem. Learn – How To Check Lymph Nodes In The Neck? Treatment for swollen nodes, there are over the counter medication and at home remedies that will relieve the symptoms while the body is being treated for the cause of the swelling (Swollen Neck Lymph Nodes: Causes – localhealth.com). In the case of a staph infection that develops into MRSA, prompt treatment will be necessary to avoid a serious life threatening condition. MRSA is a type of staph infection so strep throat doesn’t turn into it because different bacteria cause it. When there is throat or oral surgery the MRSA infection can enter through a break in the skin. Though not as serious as cancer, an infection can become life threatening. Swollen lymph nodes are one of the symptoms of infection. This is because the body will start producing white blood cells to fight the infection and also attempt to filter out the bacteria from the lymph. When the lymph nodes on the neck start to swell, it can be from an infection caused by nicks from a razor or a pimple that has been “popped” and the bacteria can enter the body. To prevent this it is important to have good hygiene and to not share personal care items like razors. When getting a hair cut it will be important that all the tools are properly sanitized between clients. 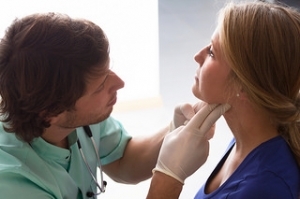 The neck lymph nodes are responsible for filtering lymph from the head and neck area.